“We love having a special greeting message and hold music for our customers.” -Gina M.
Give your phone system a custom feel with our audio library. Talkroute includes a complete audio library with various prompts and music that can be used to setup your account. You can also upload or record your own audio prompts at anytime. Record audio prompts from your phone with with our “Dial & Record” feature. Once you are finished recording, the audio prompt can be found in your audio library. 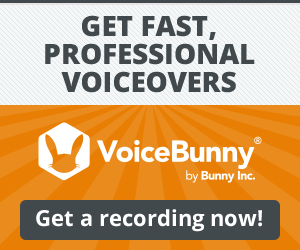 Talkroute is proud to partner with VoiceBunny and provide our customers with high quality voice talent at an affordable price.